George Washington is hailed as the First President of the United States of America, but it’s not just his only accomplishment. He is also a Founding Father and a military general who led the Patriots to victory during the War of Independence. In many of the paintings of the First President today, Washington is often depicted in his military uniform. He wears a beige vest underneath a blue colonial coat and matching beige pants. Here’s everything you need to look like George Washington. 1 White Dress Shirt Wear a basic white dress shirt underneath your vest. 2 Beige Vest George Washington is often depicted wearing a beige vest as part of his colonial uniform. 3 Blue Colonial Coat Complete your uniform with a blue colonial coat. 4 Beige Pants Match your vest with a smart pair of beige pants. 5 Brown Riding Boots Horseback riding was a way of life back then so a pair of brown riding boots is a must. 6 White Colonial Wig George Washington is more popularly known to have white hair so wear a wig if you must. 7 Colonial Tricorn Hat, Jabot, and Cuffs Set Use this colonial set to complete your George Washington look. 8 George Washington Kids Costume Set Transform your kid into George Washington with this costume set. 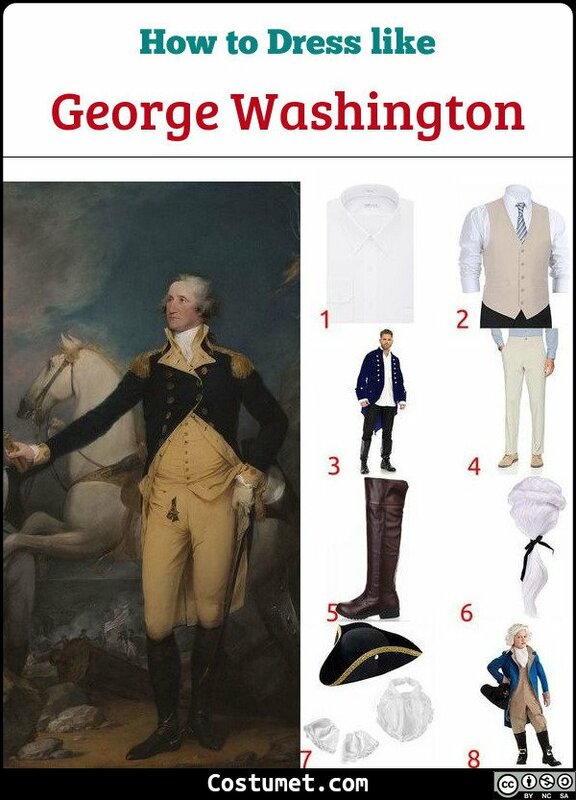 9 George Washington Costume Set Don’t have the time to DIY your costume? Get this costume set! George Washington served in office as the president of the United States from April 1789 to March 1797. He was succeeded by his then Vice President, John Adams. Donald Trump wears a formal white buttoned down shirt, neckties, a dark suit blazer, formal pants, a leather belt, formal shoes, and an American flag pin. Bruce Lee has had a few iconic outfits throughout his very short career. But his most well-known costume was the yellow one-piece he wore in Game of Death.